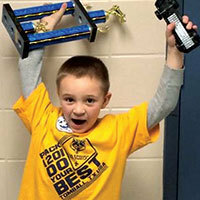 First, note that making a fast LEGO Derby Car is the same as making a fast Pinewood Derby Car. All of the Car Design and Physics principles are the same. 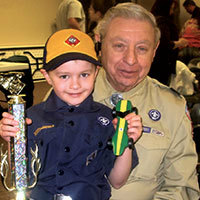 You can read our free How to Make a Fast Pinewood Derby Car or download a copy of our Winning Pinewood Derby Secrets. Note: LEGO is a trademark of the LEGO Group, which does not authorize, sponsor or endorse this site. What is LEGO Derby Car Racing? LEGO Derby Car racing is the same as Pinewood Derby Car racing except that your car is built from LEGO pieces instead of a block of pine wood. 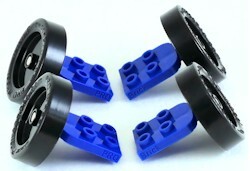 A special PRO Brick Wheel Assembly snaps into LEGO pieces so you can build a freewheeling car that you can race on a pinewood derby race track. To get the proper wheel spacing to race a LEGO derby car on a pinewood derby track, just snap in the new PRO Brick Wheel Assembly from Pinewood Pro, which includes the wheel and axle mounted on the PRO Brick. You can also use official Pinewood Derby wheels and axles but this requires drilling into LEGO bricks to secure the axles and you need to worry about getting proper wheel alignment and spacing. Whichever wheels and axles you choose for your race, we suggest using the same solution so all cars are the same. Unlike pinewood derby cars that are built once and raced once, LEGO derby cars can be quickly designed, built and re-built over and over until you get the car design you want. 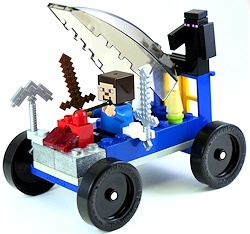 The beauty of LEGO Derby racing is that it encourages this type of experimentation and creativity. To encourage experimentation further, we setup the pinewood derby track without the timer. This allowed the scouts to race their cars, change the design, add or subtract weight and race again. When the evening was over, the scouts had designed the LEGO cars they wanted and had a feel for their car's speed. Yes, this can get messy and hectic with pieces falling off cars, but the kids loved it. They quickly designed, built and re-designed their cars and they loved the excitement of racing. We then setup the track at the next meeting WITH the timer activated for the competitive race. We gave the boys (and siblings) some time for last minute adjustments, then the cars were impounded and we raced them for speed just like a pinewood derby race…with a few twists. If you want the cars to have some permanence, then I suggest gluing together some, if not all, the pieces. LEGO parts were simply not meant to crash together and stay together! There is considerable force when a car reaches the end of the track and unless you have a long landing zone (most tracks don't), the car is going to smash into something and break apart unless the pieces are glued together. In the very least, you should glue the PRO Brick Wheel Assembly to your car. Just like your pinewood derby car, your LEGO car will perform better if you lubricate the axles. HOWEVER, graphite will wreak havoc on your LEGO parts if they are not glued together! Graphite and oil lubricants, such as NyOil, tend to migrate to everything and if (when) that happens, your LEGO connections will get lubricated and lose their connectivity causing your cool car to fall apart into a heap. I suggest carefully lubricating your axles away from the rest of the car before snapping them PRO Brick Wheel Assembly to your car. In addition, glue the PRO Brick Wheel Assembly to your car. And be very careful not to get glue near your axles! Making a fast LEGO Derby Car is the same as making a fast Pinewood Derby Car, so all of the Car Design and Physics principles are the same. 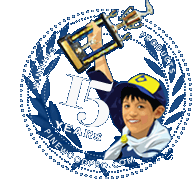 You can reference the speed tips in our free How to Make a Fast Pinewood Derby Car or download a copy of our Winning Pinewood Derby Secrets. In many respects, however, it is easier to make a fast LEGO Derby Car if you are using Pinewood Pro's PRO Wheel Assembly because they have several speed advantages built in, such as Ultra-Light Wheels and Nickel Plated Speed Axles. In addition, the axles are pre-inserted into the PRO Brick so your car is guaranteed to roll straight. Oh, and don't get caught up in "Aerodynamics". It isn't a significant speed factor. I've seen an unfinished pinewood wood derby block of wood compete in the finals. 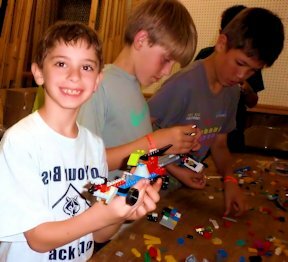 There are far more important speed factors to master than aerodynamics, so use your imagination and have fun building a cool looking LEGO Derby Car. These are the LEGO Derby Rules we used for our race. They are similar, but not the same as pinewood derby rules. 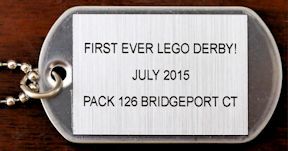 I came up with several different LEGO Derby Award ideas for our race. I think you will find them interesting and fun. 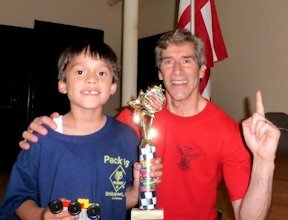 I ran several LEGO derby races for our local Pack, at a Scout Jamboree and Cub Scout recuruitment night. They were a blast! I was especially impressed that everyone from Girl Scouts to Cub Scouts to Boy Scouts and adults built and raced cars. I call LEGO derby "spontaneous, unlimited fun" because the cars can be built "in a snap" and the car designs are only limited by the variety of LEGO pieces you have. LEGO Derby Car Racing encourages experimentation as the cars are assembled and disassembled (or fall apart) so fast. 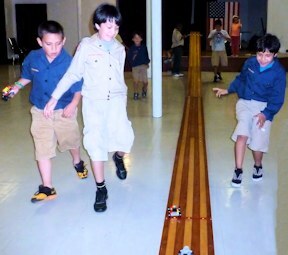 LEGO Derby car racing can be used for a Cub Scout Recruitment event or an additional scout or Church Group activity that includes siblings because the cars can be built entirely by the child. I encourage your feedback, suggestions and sharing your LEGO Derby experience. Call me at 203-400-3713. Soon we will have a LEGO Derby picture gallery so email your car pictures! Make your car slim. If your car is too chunky, there will be lots of weight in the wood, leaving less weight for your weights. You want lots of weight so you can move the center of gravity to the optimal point to maximize inertia. Before cutting your car, use a straight edge to draw lines down the center lengthwise and widthwise across your car. Then draw your car design template over these straight lines. The template and straight lines help guide your cutting on both sides of the car so everything is square. The best part of pinewood derby is designing a unique, cool car that you can call your own. Don't worry about aerodynamics because it is almost insignificant. 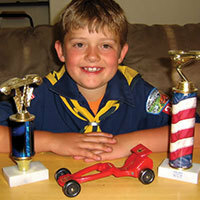 We identify dozens of other speed tips in Winning Pinewood Derby Secrets that rank far above aerodynamics.